Talk about going the distance. 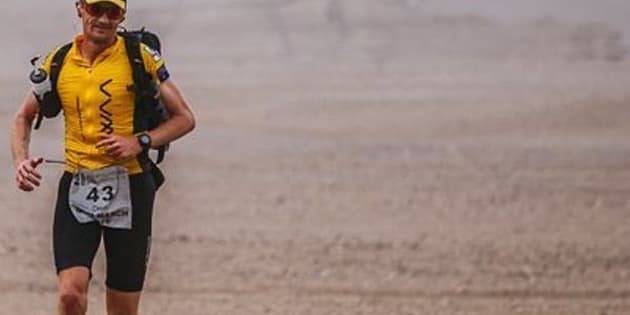 Thanks to a successful crowd-funding campaign, Dion Leonard, an extreme marathon runner is adopting a stray pup he met while running a 155-mile race in the Gobi desert in China. The funds that were raised will help cover medical and quarantine expenses so that the dog can be transported from China to Leonard’s home of Edinburgh, Scotland. The female dog, who Leonard appropriately named Gobi, joined Leonard on day two of the annual 4 Deserts Race Series and ran side-by-side with him for 77 miles, according to The Independent. Leonard told the outlet that he had noticed Gobi running with 101 runners during the first day, but on the second day, Gobi was on the start line, looking up at him. Leonard shared his sleeping space, water and food with his small companion during the race. He even lent her a hand when needed. “I carried her across rivers and over sluice gates she could not cross on her own,” he wrote on his Crowdfunder page. After the race, it was clear to Leonard that he had developed a special bond with the pooch and started researching ways to get Gobi to the UK. He learned that it would take four months for Gobi to be medically checked, quarantined and cleared for entry. All of which will cost $6,560 USD, an amount that has been surpassed due to a successful Crowdfunder campaign that raised $13,330 USD. Leonard told the BBC, that Gobi is currently in the care of a friend in China and hopes she will arrive in Scotland by Christmas.